On another sweater note, I saw these prints and videos in, I think, Busan, South Korea. 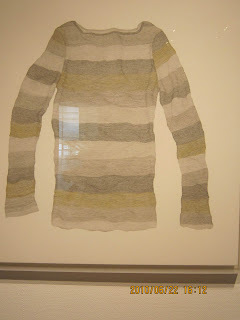 Some of the pieces were lithos, maybe, or maybe pen and ink, and some were videos of the sweater knitting itself. It was amazing to watch the sweater be created and unraveled. If I were more organized, I'd be able to tell you who the artist is. I'll keep looking. Interesting, the world grows smaller and smaller, and the digital possibilities are remarkable. Indeed! Out with the old! It would be wonderful to feel the excitement in Egypt right now. I have a student who is from Cairo, and I'm getting a tiny taste of it from him. Cheers and Happy Valentines Day to you, too! Hello, Linette, thanks for stopping by my blog.